After the success of OuiPlease for women, the brand was inspired to create a brother company to deliver the same luxury subscription experience to men. 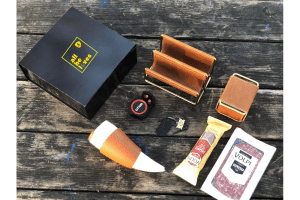 Introduced in October of 2018, OuiPlease Homme, a members-only subscription box is the first of its kind with full-sized products exclusively for men. OuiPlease Homme elevates the subscription box phenomenon. Each OuiPlease Homme variation includes a sophisticated mix of apparel, gadgets, epicure and grooming accessories from both established and burgeoning French luxury brands. What to expect: $350+ value per box for $150 every other month, ready-to-wear clothing, cologne, gym accessories, epicure and more! OuiPlease Homme is a must-have for the refined, modern man looking to experience the best of France from the comfort of home. Enjoy style the way it should be: easy, effortless, elevated. Subscribe today! Use code bienvenue20 at checkout for 20% off your first box. How would you rate OuiPlease Homme ?